I turned thirty last week – a time to look back and reflect on the big things in life. I distinctly remember the first day at university, when I walked around campus and saw students dipping their feet into the fountains at The Square. They sat together in little groups, laughed about something and obviously enjoyed their life. I was twenty-one and had just moved to the city to open yet another chapter in my life’s story. And I remember imagining what the next few years would look like: I would complete my studies quickly and then move abroad for work. I would meet new people and we’d be the best of friends who make embarrassing and beautiful memories that would last forever. I would find a handsome guy and we’d get married until we started our own family around thirty. Together we would roam this planet, always in search of our next adventure. I would say later that my twenties were the best years of my life. Even though I was never really sure if I wanted to be a teacher, I discovered that I enjoy teaching very much and I might stay a while. So I still live in Germany, have become a full-fledged teacher and just moved into my first ‘grown-up’ apartment. I own a dishwasher and seem to be really settled. I have graduated from university with a lot of effort and good grades, but all of this had its price. After my finals I had a burnout because I hadn’t taken care of myself. In times when I needed them the most, I had to say goodbye to a few dear friends and learn that some relationships are not meant to last. There have been countless weddings I have attended and many happy moments when I rejoiced with friends and their kids, but with the years I couldn’t help but wonder why I am still alone. Nor the fear of always being on my own. I have walked through the valley with friends and had to let go of seemingly strong foundations. I wrestle with questions and doubts why and how I can live my faith in this complex world. No, this is not what my life was supposed to be like. As I take a walk down memory lane, different images flash before my inner eye. The many packed bags and suitcases that carry us from one apartment to the next and accompany us from one continent to a completely different culture. A symbol for the tension of having no real home and longing for the world that’s lingering inside of me. The five of us squeezed into too small cars or way too little motorbikes riding through the African jungle. Sleeping in tiny rooms and having improvised breakfasts on hotel beds. The many days and nights when we come together from all over, holding our bellies from laughing so hard and forgetting that we’re all adults by now. No matter how scattered we are: It’s always us five against the world. The delayed flight to Johannesburg where my twenty-year old self lives away from my family for the first time. I am culturally challenged, but gain a better understanding of myself as a TCK and my role in this world. Sweet memories of late nights with study friends watching movies, cycling around town and discovering what food can do for a person’s soul. The tiny bundle of fluff who made me a godmother and grew into such a brave, funny, intelligent boy. I can hear his chuckling laugh long after I have to leave again. All those weekends with my TCK family that leave all of us physically exhausted but emotionally filled to the brim. Because it’s exactly this: We have become family; people who share similar experiences and honest questions about home, identity and belonging. The breathtaking beauty of canyons, oceans and landscapes in all the countries I was lucky enough to travel. I have swum in all the seven seas, overcame my fear of water to go diving and climbed mountains. I got to live with people from all across the world and discovered that they are the real adventure. The first TCK conference I attended completely clueless only to be blessed by people who took me under their wings and taught me about the vastness and beauty of the TCK world. Together we have pulled off quite a few conferences and learned from experts all across Europe. What started out as a temporary student job became an unexpected learning experience when I ended up organizing a congress for several thousand people and was surprised how much responsibility people trusted me with. I have learned to take better care of myself and open my eyes for the many blessings already out there. God was and is bigger than my concepts, questions and doubts. When I pay attention to it, I am overwhelmed by mundane gifts and the faithfulness of old companions. In times when saying goodbye to friendships and much-loved beliefs became really painful, I discovered writing as a helpful way to reflect and process. Many people blessed me with their encouragement and comments on-and offline, but I never imagined that my writing would end up in a book. I sense for the first time what it means to settle down at one place for a while and create a home – a feeling unknown, yes even forbidden, for a TCK. I meet the right people at the right time who challenge me to take risks, to stay and rest, to give something of myself. I can talk to friends who feel the same and we wait in this uncertainty together. Why do I write these things? I don’t want to brag about myself and everything I have achieved. No, these stories are a reminder for myself to not lament the things I don’t seem to have, but to celebrate that my life has turned out so different from what I imagined it to be all these years ago. Full with tasks that challenge and inspire me. Full with loving, creative and inspiring people who join me along the way and enrich my life with their presence, actions and words. In the midst of my hunger and desires I discover gratitude that brings a new depth to my life. Rich with experiences with and in this world. Rich with memories of all the necessary steps that have brought me here. Rich with dreams and excitement for what’s to come. My life is a collection of puzzle pieces which challenge me at times, but make everything more colorful, meaningful, beautiful. Drive for hours, visit friends in other cities or countries, stay at holiday homes or at someone’s house. b) it felt somehow wrong to be in a fancy clean place and have other people serve you when there’s poverty and a completely different culture out there to explore. I loved our kind of vacations. We saw, experienced and tasted things so far off from any hotel complex or all inclusive trip. Whenever I travel today, it’s as close to the local culture as possible. So it’s quite understandable that I was hesitant at first, when a friend called me in April and asked if I wanted to escape into the sun with her. One week in Egypt, all-inclusive style. But when I looked at the non-changing, depressing grey sky outside, I agreed to come. When we arrived at the hotel at 3 a.m., I couldn’t believe we would stay here. Everything seemed like a magical wonderland – a beautiful compound with little bungalows and a pool, directly next to the Red Sea. The first day was weird and I caught myself asking, “is this included in the price?” whenever we were offered large towels, more food or a drink. It felt like I don’t deserve to be spoiled like that. But I do. You do. We all deserve to treated nicely and be pampered once in a while. When life keeps us busy and drains all energy from us – we all deserve some space for rest and service and restoration. Even more so, we need the permission to let go and accept the gifts all around us. They might be a week in some beautiful place. They might be a small act of service that someone does for us. They might be a day off when we allow ourselves to fully rest. They might be a word of encouragement, a good night’s sleep, a healthy meal with friends. The One who made us, the One who knows all and sees all, has offered us life in abundance – and it’s all-inclusive. Full Disclosure: The week was balm to my soul. Sleeping without an alarm clock. Reading without a time limit. Overcoming my fear of water (that’s a whole different story to share!). Spending the day without an agenda. What was the best vacation you’ve had so far? What will your next vacation look like? They say Third Culture Kids fly before they walk. I wasn’t even two years old and could barely walk when my parents took me on my first flight to Crete. It was the first of many journeys around the globe and the beginning of a lifetime of memories. A plane ride can change everything. You board the plane in one coutnry and get off in a totally different world. many TCKs would probably agree that this doesn’t come wihtout baggage. Befoer airplanes were invented, people spent weeks and months on ships to get from one place to another, and maybe that was actually a good idea. While you were traveling, your heart and soul had time to catch up with your body. Today we jump between continents and cultures so quickly that we sometimes lose ourselves along the way. I can’t help but travel. Whenever I’m at the airport – even just to pick someone up – there’s this tingling sensation inside of me, as if a spell begged to fly away. Flights take me to other countries and open up the world to me. They’re the first key to unlock someone else’s culture and story. Flights challenge me to step outside my own bubble and discover that the world is bigger, more diverse and colorful than what I see around me. They call into question what I’ve known about myself and others. They provide vast opportunities to learn and to grow. Flights connect me to dear friends I had to leave behind, they serve as a conduit to seemingly lost parts of my own self. Flights might never fully cure my wanderlust, but they give me a glimpse of what could be. Do you enjoy flying? What have you learned from traveling? There are two souls in this TCK heart of mine. I want to explore this beautiful world, marvel at nature’s wonders, discover all the richness it has to offer. I want to go further and wider, see and smell and taste things I have not encountered before. I want to meet people who are different from myself, listen to their stories and learn something new. I don’t want to go somewhere twice because there is still so much more to explore. I want to stay in one place and dig into its soil, inspect its little quirks and hidden treasures. I want to go deeper and longer, see and smell and taste things that are familiar and remind me of home. I want to build connection with people and see them develop into friendships, I want to experience belonging. I want to know what it feels like to come home to a place and people and be fully myself. Two souls rage inside of me. Begging me to return and stay. As a TCK, I roam the globe in search of adventure, discovery and wonder. I get lost in different cultures, smells and friendships. I leave pieces of myself behind whenever I have to say goodbye. And then I travel to find them again. People like us have pieces of ourselves scattered across this globe – and travel gives us access to our complete selves. Any other Third Culture Kids who can relate? How do you deal with this battle inside of you? I’m writing this from the Grand Canal in Triest, Italy where I vacation with my family for a week. In typical bella vita fashion, we have spent the last few days with lots of delicious food, more wine and even more gelato while strolling through the streets that are heavily drenched in Austrian, Yugoslavian and Italian history. Today we climbed the steps to San Silvestro, the oldest church in the city when my sister called me, “Come quick, you need to listen to this!” I could hear the sounds of a piano – distant at first, then louder and louder as I came closer. I entered the little basilica and there was a young man playing Beethoven. We could have walked by and just continue with our sightseeing. We could’ve brushed it off and just carry on with life. But there was something about this sound that made us pause. I sat down in one of the rows, closed my eyes and enjoyed this free concert. The deep roar of the bass notes. The thrill of the fast arpeggios. The energy that made the entire room vibrate. What a beautiful gift in the middle of a warm summer day. I want my life to be like this piano concert. There shall be something about the things I do that makes people to break in their step and pause. There shall be something about the words I speak and write that attracts others to come closer and listen in. There shall be something about my life and my relationships that invites others through the door, allows them to pause and find some rest in the middle of their busy lives. Welcome to the new year everyone! Did you have a good time with family, friends and food? I hope so. My New Year’s Eve plans were cancelled at the last minute and I had to find an alternative quickly. Somehow this event comes with so many expectations: the perfect location, the perfect food, the perfect conversations – the last night of the year has to be the best party ever. The more I thought about it, the more stressed out I felt about it all. Why do we make such a big fuss about things sometimes? We work and prepare and keep ourselves busy. We worry what other people will think about our homes, clothes, friendships, life plans and decisions. We try so hard to follow all the rules to please God and be good Christians. We bury ourselves in arguments and theologies, just so we know it all and deal with it all. This Christmas was full of people. A blogger friend from the US and my little brother from South Africa came to visit me and we spent lots of nights talking. About the joys and pain of life. About what it means to deconstruct your faith and rediscover old truths. About the simplicity of it all when we watch out for it. We laughed and we cried together and I realized: this is what life and faith are about. Relationships. Simple. Complex. Challenging. Beautiful. Life-giving. So if I have to say anything about this new year ahead of us: Let’s keep it simple. Let’s be okay to not be perfect all the time. Let’s leave the mess for a while and focus on the people around us instead. Let’s never grow tired of sharing our time, our hearts, our lives. Let’s continue to look out for God in the midst of all of this, right here in the mundane. I ended up celebrating New Year’s Eve with a family I didn’t know that well yet and their two kids. A very small group of people, Raclette, stories, and watching the fireworks over the city from the balcony. Writing for Five Minute Friday today. One prompt, five minutes to write and an awesome community of writers and cheerleaders. Why don’t you join us this year? If you’re German-speaking and looking for a way to discover God in your mundane narratives, now might be a good time to start reading my book “Fliege ins Leben, lande bei Gott”. I would love to see you on this journey! 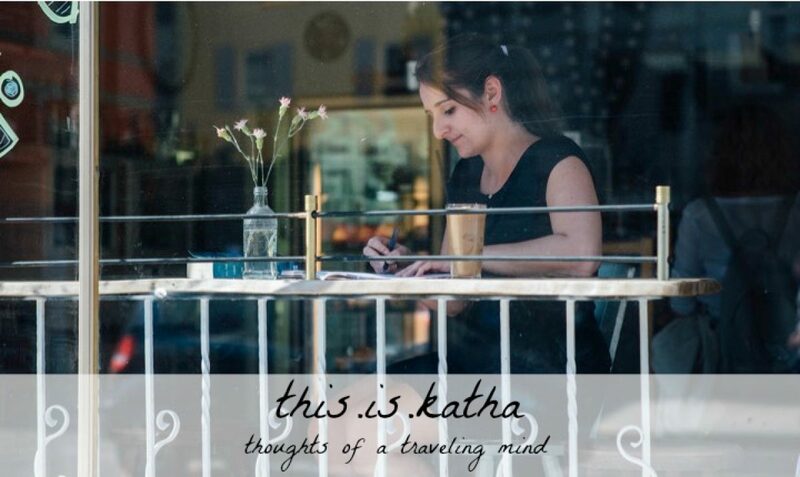 Author Katha von DessienPosted on January 12, 2018 January 12, 2018 Categories English Only, Faith, Five Minute Friday, Friends, Germany, mundane narratives, Travel, Writing11 Comments on Let’s keep it simple. What sound does silence make? When the noise of life suddenly stops? When busyness comes to a halt? When the voices of “you have to, you should, why don’t you” die down until they’re nothing more than a faraway echo? The steady movement of my torso, lifting with the inhale, falling down with the exhale. The distant sounds of the life surrounding me. Leaves falling to the ground. The inner battle raging inside of me. Can I really rest now? What about all that work waiting for me? The nagging questions, the uncomfortable feeling of waiting. The loss of comprehension, fading into quiet surrender. For now, stay right here. Welcome to the silence. What can you hear?